This week in the Phoenix, Wen Stephenson profiles Naomi Klein -- "black-clad and sharp-tongued mistress of the global anti-corporate left, friend to Occupiers and scourge of oil barons" -- as she turns her attention to the cause of climate justice. Below is a longer excerpt from their conversation -- about Klein's alliance with 350.org's Bill McKibben, her views on the environmental movement, and the ways in which her struggles to become a parent informed her views on climate (and vice versa). This interview took place on November 8, 2012. It has been edited for length and clarity. Wen Stephenson: How did your collaboration with Bill McKibben and 350.org come about? What led you personally into this? Naomi Klein: My first engagement with the climate issue was around the issue of climate debt. I was actually doing research about reparations for slavery, writing a long piece for Harper's, in 2008. I've always been very interested in the Durban anti-racism conference [in Durban, South Africa]. In the lead-up to that UN conference in September 2001, the reparations movement in the United States and in Africa really took off. It was becoming incredibly mainstream. Manning Marable was having pieces published in Time magazine, it was on the op-ed pages of The Wall Street Journal and The Washington Post. 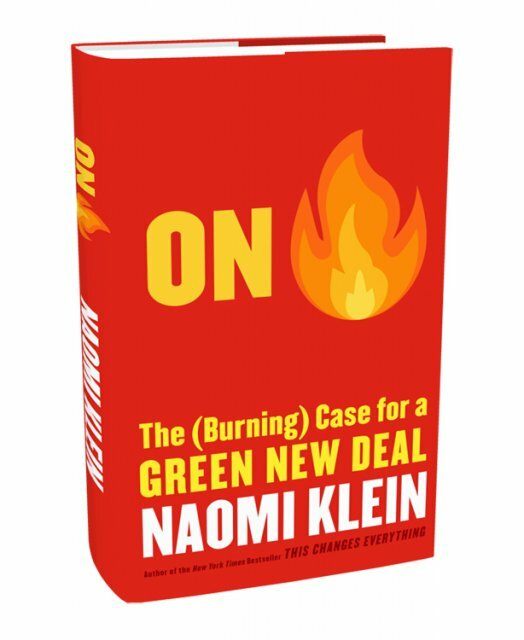 Naomi Klein, black-clad and sharp-tongued mistress of the global anti-corporate left, friend to Occupiers and scourge of oil barons, stood outside a dressing room backstage at Boston's Orpheum Theatre one night last month, a clear-eyed baby boy on her hip. "I'm really trying not to play the Earth Mother card," Klein told me over the phone the week before, as she talked about bringing Toma, her first child, into the world. But she didn't need to worry. Inside the dressing room, she'd been fielding questions from a small gaggle of young reporters alongside 350.org's Bill McKibben, who had invited her to play a key role in the 21-city "Do the Math" climate-movement roadshow that arrived at the sold-out Orpheum that night. With a laugh, Klein noted to the reporters that McKibben's devastatingRolling Stone article last summer, "Global Warming's Terrifying New Math" — revealing that the fossil-fuel industry has five times more carbon in its proven reserves, which it intends to extract, than the science says can be burned if we want to avoid climate catastrophe — had received no industry pushback. Less than three days after Sandy made landfall on the East Coast of the United States, Iain Murray of the Competitive Enterprise Institute blamed New Yorkers’ resistance to big-box stores for the misery they were about to endure. Writing on Forbes.com, he explained that the city’s refusal to embrace Walmart will likely make the recovery much harder: “Mom-and-pop stores simply can’t do what big stores can in these circumstances,” he wrote. And the preemptive scapegoating didn’t stop there. He also warned that if the pace of reconstruction turned out to be sluggish (as it so often is) then “pro-union rules such as the Davis-Bacon Act” would be to blame, a reference to the statute that requires workers on public-works projects to be paid not the minimum wage, but the prevailing wage in the region.